When Rachel dies suddenly at the age of 36, leaving behind her wonderful husband Max and beautiful daughter, Ellie, the last thing she expected was to have to watch helplessly as they mourn her death. Its meant to be the bereaved who go through the seven stages of grief from denial to acceptance, but as Max and Ellie work through their grief, Rachel too struggles to come to terms with her death and all that means – especially when her husband starts to to date again, and she realises that one day he will find love, and that Ellie will have a new mother figure in her life. “…..I wonder, too, whether it’s more distressing to watch your family in mourning for you or whether it will be worse when, one day, they stop grieving and start living painlessly without me”. We know from the very first page that Rachel has died unexpectedly, after a celebratory evening out with her husband Max, and is now completely alone, somewhere in the afterworld. Every so often she is briefly granted access to view moments with Max and/or Ellie and we experience with her, her grief and anger that she is no longer with them to offer reassurance and comfort. This afterworld is not a happy place where families are reunited in death, but is bleak and lonely for Rachel and her time spent watching her loved ones are times of both happiness and agony as she sees them grieving and feels helpless in being unable to make them aware of her presence. We see her frustration and jealousy as Max starts to date again and her worries that she will be forgotten and that her memory will be slowly erased from their lives. This is a compelling and beautifully written account of Rachel’s transition through the grieving process and watching others live the life that she will never have. Unusually, we see the aftermath of a death through the eyes of the deceased and it presents a powerful image. Having been through the grieving process myself I could identify with Rachel’s feelings of loss. The writing was perceptive and warm with some amusing moments, especially with Max’s first attempts at dating! Despite being an incredibly poignant and sad story, this is not a morbid book by any means. The characters are a joy to spend time with, especially 6 year old Ellie, and Max’s devotion to her was lovely to see. The book isn’t all about Rachel and certainly the main characters in Rachel’s life are rounded and believable. I really felt for Max when well meaning friends and family tried to persuade him to “move on”. At the end of each stage of the grieving process, Rachel learns something about herself and it is this journey of realisation that adds an extra element to the story. I found this an emotional and yet uplifting read and I became completely engrossed in the lives, and death, of Rachel and her family. This is an excellent debut novel which I would have no hesitation in recommending. Just one tip – make sure you have some tissues handy! My thanks to Real Readers and the publisher, Penguin, for the review copy of this book. I certainly look forward to reading further books by Ms Beckerman. awards. 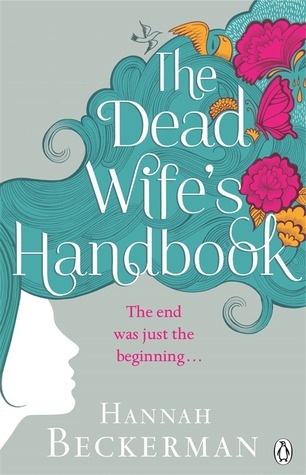 The Dead Wife’s Handbook is her first novel. Please do read it, I'm sure you won't be disappointed. I liked this book despite the beginning I thought I wouldn't, I agree with yoour thoughts on this, thanks for sharing. If you fancy reading mine it is posted at SMBSLT. This is the second review I've read for this book and , more and more, I think this would be a beautiful and rewarding read. Thanks for the review Karen. Really like the look of this one, and a lovely review Karen – think I need to sign up for Real Readers…!